Just before the major ABC news bulletin at 7.45 yesterday morning, I thought I was hearing a joke, or something that had happened earlier in the programme that I missed. Did my ears deceive me? 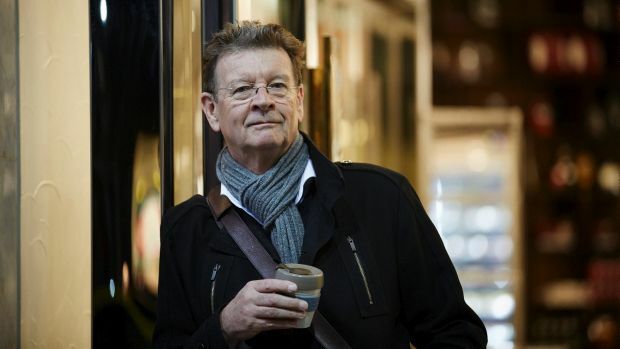 Breakfast broadcaster Red Symons announced his retirement from radio. I would guess he was on a annual contract and it was simply not renewed. To quote him about the non renewal, "I did not ask and they did not tell me" (why). 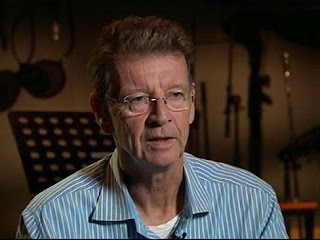 The Age newspaper called it, ABC broadcaster Red Symons has announced he is hanging up his headphones, after he was sacked from his breakfast show. I suppose our ABC Radio knows what it is doing. R could not bear Symons when he began, but has become a similarly devoted listener as I am. R suggested that our ABC want a national local radio breakfast programme, but I doubt that. I think the real reason behind Symons non contract renewal sacking is his age. At 68, he is getting on. He did blot his copybook earlier this year when interviewing a fellow ABC broadcaster, using his normal style of humour and had to apologise for what was perceived as racism. That was fair enough. But you have to understand his sense of humour to see where he was going. By playing the racist comment, he brings strongly held prejudices into the open and up for discussion. But, the person was offended and he probably went too far, hence the apology. There is plenty of talent within our ABC who could replace him, but I suspect it will take me a long time to get used to anyone new. Because I am a shift worker, I have listened to all ABC Melbourne broadcasters until a few years ago. 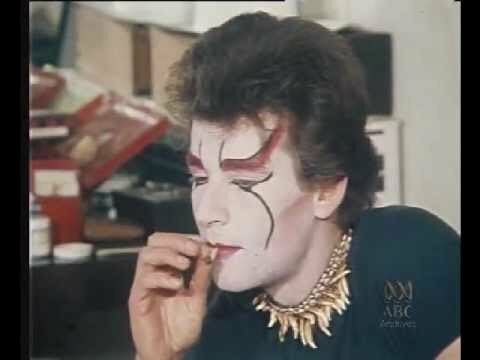 I have ceased to be such a fan, now only listening to Red in the breakfast slot, Jon Faine in the morning, AM, The World Today and PM at times. I was less than impressed with the boss of Our ABC Ms Guthrie's announcement of a shake up. I am even more than concerned at what may happen at RN, where they make expensive radio programmes of very high quality. Most are podcast and the numbers of downloads, mine included, are extraordinary. Back to Red. 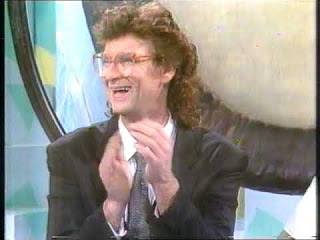 As he said, he had five years as a (mega) pop star, ten years in tv and fifteen years on the radio. Do not worry. I have other irons in the fire, so to speak. He was full of optimism as he spoke of his departure. This coming week will be his last on air. 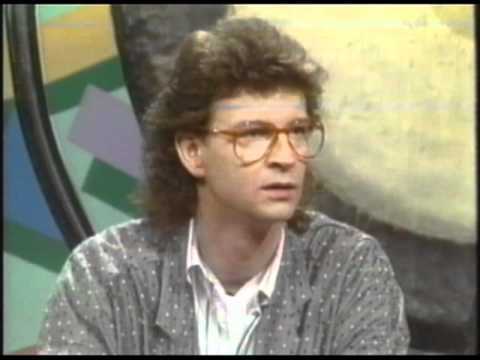 I think ABC Radio has treated him badly and made a mistake, but time will tell. Perhaps it has a cracker broadcaster set up to take over. If you are not in Melbourne, you can listen to him online next week, AEDT 5:30 to 7:45. 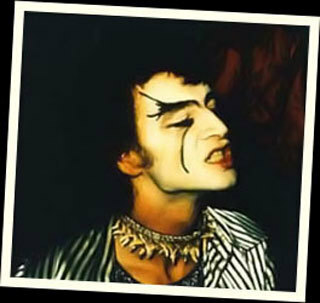 Pop star Red, of the band Skyhooks. TV Red, Red Faces on Hey, Hey, It's Saturday. Radio broadcaster Red, on ABC Melbourne. I will really miss Red on the radio. Thank you Red for the laughs and the education over so many years. The bitchy old queen, John Michael Howson, was also sacked today from a commercial radio station after suggesting greenies should hang themselves. No loss at all. I could add something personal about him, but I shan't. I first heard of Mary Schneider on our local Melbourne gay radio station Joy Melbourne, 94.9 on the FM dial. She was interviewed by the late Adam Stobbs, with whom she seemed to form a rapport, as she made a return visit to the station, or a phone interview at least. I thought she was brilliant. Her daughter Malinda walks in her mother's footsteps and she is pretty cool too. Ah, you are wondering. What does this Mary do? Well, she yodels. She does so very well, and her daughter does too. I was reminded of her when she had a chat with execrable Macca a couple of weeks ago on our ABC Radio, and she sounded just lovely. I heard a piece that she recorded in America, but I cannot find it on YouTube. Make do with this. The tv programme The Block has contestants renovating various types of properties. 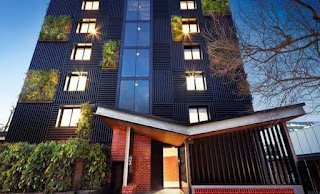 One such property was an old 60s motel in Park Street South Melbourne, renovated and made into apartments by the contestants in 2013. The series was called Sky High. The vertical gardens are rather attractive. So how are the vertical gardens faring some four years later? Not terribly well, I'm afraid. The building looks terrible. Chelsea in London is a very expensive, if not the most expensive part of London. Read Marie's latest most interesting post on Sloane Square and Chelsea in London as she continues her Tube line investigations. Chelsea in greater Melbourne was once known as a rough outer seaside suburb. Maybe it is not so rough now, but not too many social climbers aspire to live in Melbourne's Chelsea. Camberwell is not a highly desirable London suburb, yet our Camberwell in our bible belt is ever so desirable. Pubs are illegal in our Camberwell. If a restaurant wants to serve alcohol, it must go to a council vote of local residents. (this may have changed recently). I have struggled for years to get the locations of local towns Winchelsea and Whittlesea correct. We drove through Winchelsea on the way to our nephew's wedding, so that is finally sorted in my head. Not so Braybrook and Braeside. Without confidence I say, Braybrook is south and Braeside is north. No, it must be the other way around. Dunno, really. Then there are our tongue twisting Aboriginal place names and it took me years to get the pronunciation of Wurundjeri Way (say it as it is spelt) correct, and of course I misspell it too and had to Google to get that right. Oh well, at least we never adopted difficult Welsh place names and don't have to get our tongues around such weird place names such as our found in Wales. John Gray of Wales has twice had local people pronounce the name of the village where he lives, and I am really none the wiser. This is the latest effort for Trelawnyd. To think, the Welsh language was dying out and some fool government has resurrected it! We had to head south for some reason I have now forgotten. Where to brunch was the question on our minds. I suggested Elwood Village, a lovely residential part of the City of Port Phillip (St Kilda). Elwood Village is based along Ormond Road. It is a strange area as it is considered an inner suburb, yet it doesn't have trams, which is very odd. There are a couple of bus routes that pass through and Elsternwick Railway Station is about 1 kilometre away, and so it is an unusually highly car dependant inner area. However, Elwood was not always so public transport poor. For reasons I have forgotten, rather than by private companies and local councils, Victorian Railways built a tram line from St Kilda Station to Brighton Beach Station. It differed from the rest of Melbourne's tram system in that it used broad gauge tracks, the same as Victoria's trains, and not standard gauge as is Melbourne's normal tram system. Unfortunately the line was closed down about 1960, a very bad period of time for tram systems around the world. About ten years ago I took this photo that says 'Cars Stop Here', meaning it was a tram stop. Amazing that it was still visible four and a half decades later after the system closed. It would have been nice if it was preserved in some way, but no. As you can see, it has now been painted over. What a shame. Just a few snaps I took after we had a bite to eat at the bakery. This is some variety of bottlebrush. This is famous cafe on the corner, so famous I cannot recall its name. Turtle comes to mind. I thought the arguments and reasoning in this Fairfax Press article, on high property prices and how young people are struggling to buy a home, quite sound until I reached almost the end and this single sentence caused some steam to emit from my ears. Older generations who joined the housing party were able to take out large mortgages, safe in the knowledge that inflation would erode the real value of the loan, while wage gains would boost their ability to repay. Believe me, when I managed to cobble together $5,000 in 1982, a couple of thousand first home buyers government grant, a few thousand borrowed on my credit card that I had to fudge figures for as it would not have been acceptable to the lender, a couple of thousand borrowed from R and a $30,000 loan from a building society (higher interest rate than a bank) to buy a $42,000 house, I was not safe with any knowledge that inflation would erode the value of the loan or wage gains would boost my ability to pay off the loan. I worked six days a week for a number of years before dropping back to six days every second week. I never felt any sort of financial security until about 1993. In a decade we had one modest holiday to New Zealand, the cost lessened by us having a third person with us, after which we vowed we would never travel so closely with a third person again. The house had barely any hot water, clogged and rusted old pipes, non functioning Holland blinds, moth eaten carpet, a semi outside lav that was filthy in the worst possible way, broken sheets of fibro cement on the garage with heavy wooden doors that were nearly falling off, no roof insulation, a broken concrete driveway, a tiny fanless gas heater in the lounge room ....the list is very long. Over the years we worked very hard to turn it into a comfortable home, and we did. Young people have my full sympathy and I do think it is harder than ever to get that start with the first property, but don't ever think it was easy for most of us and we certainly went without to make that start. OMG. The concrete breakers are at work. I think there were a total of six, to break up the old tram track set in concrete. The noise was only for one day, I think, but so loud. It was the day the fragile Hippie Niece, her sister Oldest Niece and all four younguns visited, along with the nieces' mother. What a nightmare, including parking. Ah, trenching to connect up the new tram tracks. A big trench, I think for stormwater. Trees are protected from being bumped my machinery. We've got new track down below. Remember, the sleepers sit on a layer of compacted fill, a layer of concrete goes around the sleepers, then compacted gravel, followed by asphalt. The machinery used for laying track is so high tech. It is dark? No reason to stop working. Am I the only person who remembers the tv show, The Rag Trade? when I was in utero? "Everybody out!" This is good. The asphalt is going in. Things are nearing completion. Tram stop patforms are being formed.